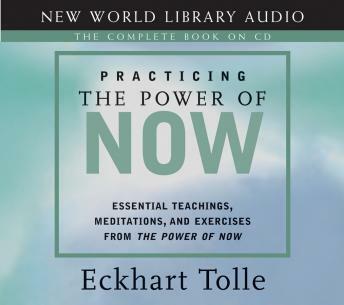 Practicing the Power of Now extracts the essence from Eckhart Tolle's teachings in The Power of Now, showing us how to free ourselves from "enslavement to the mind." The aim is to be able to enter in to and sustain an awakened state of consciousness in our everyday life. Through meditations and simple techniques, Tolle shows us how to quiet our thoughts, see the world in the present moment, and find a path to "a life of grace, ease, and lightness." Great book, brilliant narration. It's one of the best books I've read and would recommend it to everyone. Eckhart’s voice alone takes you directly to the present moment. I feel instantly calmer and connected listening to this audio book and im enjoying it over and over again. one of the best awakening books ever! be in the NOW! Very mind opening. A must read and a great tool to help yourself evolve and become a more stable person. This is worth thinking about, don't deny yourself this.